Ryder (Ryder System Inc.) is one of the oldest and largest trucking and transportation companies in North America. Ryder was originally founded by James Ryder back in 1933 in Miami, Florida as a concrete delivery company with just a single truck. The company grew very rapidly due in part to the rapid expansion of commercial trucking which at the time was quickly replacing rail transport as the backbone of U.S. commerce. By 1940 James Ryder had a fleet of over 50 trucks and he started to shift the company's focus from distribution to leasing. By the start of the 1950s Ryder was one of the fastest growing trucking companies in the country. In 1952 the company nearly doubled its size with the acquisition of Great Southern Trucking Company. Three years later Ryder went public and it continues to trade on the New York Stock Exchange under the ticker symbol "R". As a public company Ryder had access to large amounts of capital which it used to expand into the supply chain and long distribution markets. Today Ryder's is one of the most recognizable trucking companies in the United States. Ryder's trucking business is focused on 3 primary segments: (1) fleet management / leasing; (2) transportation / distribution; and (3) contract carriage. Fleet management is Ryder's largest business division accounting for over two-thirds of company revenues. The fleet management business is primarily based on long and short term truck leasing. Ryder owns a fleet of over 33,000 trucks which is one of the largest in the entire industry. The company leases these trucks (individually or in a group) out to commercial companies and individuals for use in transportation, shipping, moving, etc. Here is a brief overview of how Ryder's fleet management and leasing business works. Let's say you have a small or mid-size company that manufactures widgets and sells them to widget wholesalers. Your company regularly needs to transport the widgets on trucks for delivery to wholesale customers all over the country. Your company doesn't have enough capital to buy and maintain its own fleet of commercial delivery trucks. Instead your widget company can go to Ryder and lease a fleet of 20-25 Ryder trucks. Ryder not only provides the trucks but will also service and repair them and make sure all safety permits and everything else for the trucks are taken care of. Ryder will even sell you insurance for the trucks. All your company has to do is hire some drivers. So what happens if you are involved in an auto accident with a Ryder truck? As explained above, if you get in an accident with a Ryder truck it is probably being leased. This means the driver is not a Ryder employee but rather an employee of the company that is leasing the truck from Ryder. The company may have its own insurance or the truck may be insured through Ryder. Make sure you find this information out if you are involved in a Ryder truck accident. If you are involved in an accident with a leased Ryder truck the company that is leasing the truck and employing the driver is primarily liable for the accident. Ryder may not be directly liable in this situation. In some cases, however, the driver may be a Ryder employee and the truck may actually be party of Ryder's contract carriage fleet or some other business department. In those situations Ryder will be primarily liable for the accident. These situations will be less common with Ryder because the company only employs 500 professional drivers. Even with a leased Ryder truck, however, Ryder may still have some direct liability under a negligent entrustment or leasing theory. Although leased Ryder trucks are involved in a large number of accidents on Maryland roads every year, Ryder is usually not named as a direct defendant in these cases for the reasons explained above. Ryder is still named as a defendant in about a half dozen auto tort lawsuits in Maryland each year. Most of these lawsuits involve Ryder Truck Rental which is the short-term segment of Ryder's leasing operation. Ryder is usually represented in these cases by the Baltimore insurance defense firm of Rollins, Smalkin, Richards & Mackie, LLC. Summarized below are jury verdicts and reported settlements in auto tort cases in which Ryder was either named as a defendant or a leased Ryder truck was involved in the accident. Bridges v Addington (Oklahoma 2016) $268,000: 12-year-old boy was crossing the street in a crosswalk when the defendant truck driver hit him while executing a left turn. The driver was an employee of a local logistics and short haul delivery company and he was driving a leased Ryder truck. 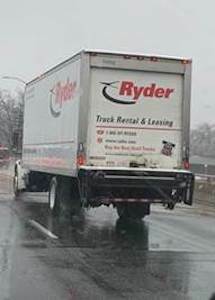 The Ryder truck was part of a fleet of leased by the logistics company. The boy's mother sued both the driver and the logistics company claiming the driver was negligent and under the influence of prescription pain drugs at the time. Defendants denied fault and claimed the boy ran into the intersection without warning. The case was ultimately settled for $268k. Chandra v Chaney (California 2016) $800,000: 37-year-old plaintiff was driving to work on I-80 when he was struck by a tractor trailer truck driven by defendant while attempting to make a lane change. The collision caused plaintiff's car to roll over several times and he suffered a concussion and numerous herniated discs requiring surgery to repair. Defendant was a professional driver employed by Anderson Corporation Inc. and the tractor trailer was part of a fleet of leased Ryder trucks. Defendant disputed his liability claiming he made a safe lane change. The case went to pretrial mediation but defendants refused to go above $600k. After a trial the jury awarded $800k. Starkey v Hanmi Inc (California 2014) $248,000: plaintiff was rear-ended on I-70 by defendant who was driving a large truck which his employer was leasing from Ryder. Plaintiff alleged various back and neck injuries with partial permanent disability. A jury awarded $248,000 in damages with included $201k for lost future earnings capacity. If you have been involved in an accident with a Ryder truck contact the auto accident lawyers at Miller & Zois for help. Call us as 800-553-8082 or get an online consultation.